The Atiku/Obi Presidential Movement, a group for the actualization of the Presidential ambition of Alh. Atiku Abubakar has promised to deliver 10 million votes for the former Vice President. Amb. Niyi Omoyele, Director General of the movement disclosed this when he led National and state executives on a courtesy visit to the wife of the Presidential candidate of the Peoples’ Democratic Party (PDP). The group which also vowed to resist all forms of rigging in the Presidential election, said that the movement had structures at the grassroots and across the 774 local government of Nigeria. Omoyele said that the movement has been in existence since the return of democracy in 1999 and had campaigned for Obasanjo-Atiku, Yar,adua-Goodluck, Goodluck-Sambo and was now going to campaign for Atiku-Obi. He said that any attempt to rig the 2019 election would be resisted by members of the group as the electoral law now provides for the instant announcement and transmission of the result from the polling unit and wards level in the presence of all stakeholders. “Members of the Atiku/Obi Presidential movement are optimistic that 2019 election is the divine time for Atiku’s Presidency because of the overwhelming acceptance of his candidacy across the country. “Nigerians are desirous of change, the type of change that only Atiku Abubakar can provide,” he said. He reiterated that the group is targeting to mobilise at least 10 million voters in synergy with other like minds toward the successful outing of Atiku/Obi at the poll. 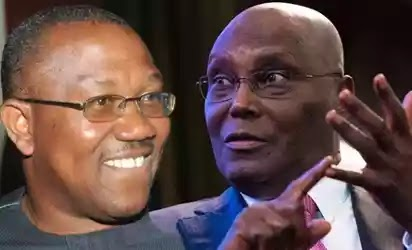 A member of the national executive of the group Prince Joshua Idowu described Atiku as a good product that was easy to sell to the electorate. INEC designing special card reader, result sheets for APC – Secondus The National women leader of the group Mrs Amaka Ofor also said that their women across the 774 local government in Nigeria have concluded arrangement to stage a one million solidarity walk for Atiku in Abuja. Responding to the group, Atiku’s wife, Hajia Titi Abubakar thanked them for the visit and appreciated them for their continued support and solidarity to her husband.